Easily maintain calcium, alkalinity, & magnesium in your reef! The 2-Part Calcium & Alkalinity Total Package is the perfect answer if you want to make your own 2-part liquid dosing solutions and start dosing. Easily make single or multiple gallons of each solution at a time with the bulk packaging. 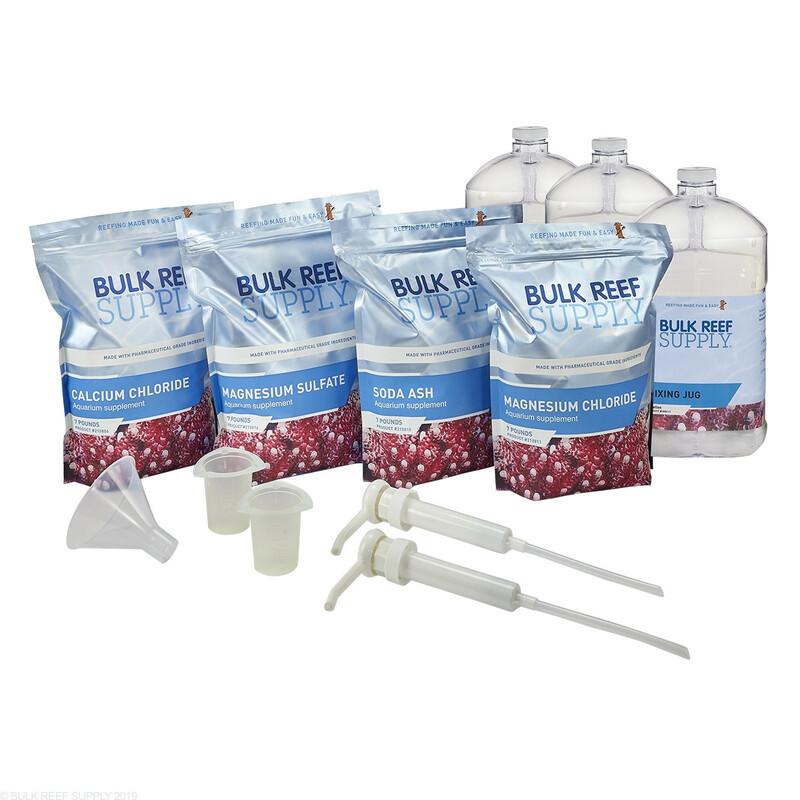 The kits include everything you will need to replenish calcium, alkalinity, and magnesium in your reef tank, everything from the additives, mixing jugs, dispensing pumps, and a funnel to keep things clean! 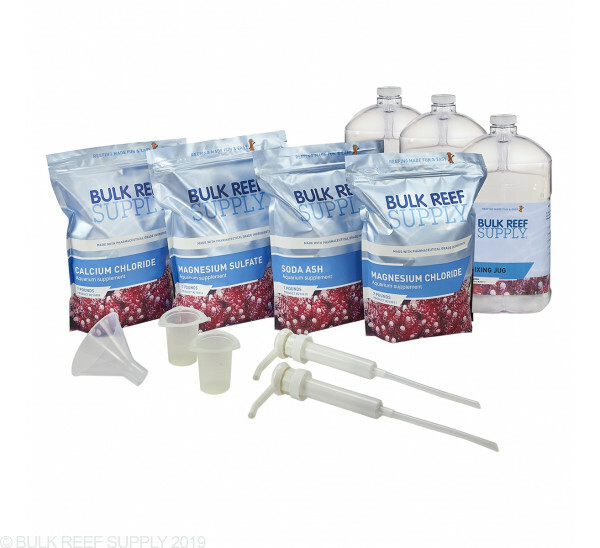 Bulk Reef Supply 2-part additives are made with only pharmaceutical based ingredient. Since calcium, alkalinity, and magnesium are the backbone to the chemistry of your aquarium, using high-quality additives makes it much easier to keep a cleaner reef tank with fewer impurities, leading to better coral coloration and growth! When you are ready, use the BRS Reef Calculator to know exactly how much to dose! BRS Calcium Liquid Solution - Fill a 1-gallon container 4/5 full of RO/DI or distilled water and then add 2 1/2 cups of BRS Calcium Chloride into the container. Secure the cap on the container and shake it for about 10 seconds to help start the dissolving process. Remove the cap and fill the container the rest of the way with RO/DI or distilled water. Give the container a few more shakes and then let it sit until all the salts have fully dissolved before use. BRS Soda Ash Liquid Alkalinity - Fill a 1-gallon container 4/5 full of RO/DI or distilled water and then add 2 1/3 cups of BRS Soda Ash into the container. Secure the cap on the container and shake it for about 10 seconds to help start the dissolving process. Remove the cap and fill the container the rest of the way with RO/DI or distilled water. Give the container a few more shakes and then let it sit until all the salts have fully dissolved before use. BRS Magnesium Mix Solution - Fill a 1-gallon container 1/2 full of RO/DI or distilled water and then add 5 1/4 cups of BRS Magnesium Chloride and 2 cups of BRS Magnesium Sulfate into the container. Secure the cap on the container and shake it for about 10 seconds to help start the dissolving process. Remove the cap and fill the container the rest of the way with RO/DI or distilled water. Give the container a few more shakes and then let it sit until all the salts have fully dissolved before use. Decided to try BRS 2 part to save some money - switching from B-ionic. Long story short, I was unable to get this 2part to function appropriately within my system. Dosing it in 30 minute intervals apart from each other every hour, I still had too much precipitation in my tank, and I could not raise my kH or Ca levels. Dosing from .2ml/gal to 3ml/gal with no changes, observed over a month of use. Switched back to B-ionic and had no issues with parameters. It's fairly cheap. It mixes well. The pack came with everything I needed. I love BRS. Such a wealth of instruction and experience available on Youtube. I love the fact I can purchase products like these from such a great company. I was able to get my dosing pump and testing up in just a few days. I use all the videos made by BRS because they are reliable and offer real life testing to prove the products work. Thanks for taking me to the next level BRS and keep up the good work. Great package and product easy to use couldn't be happier. Been using this 2 part from brs for 3 years now man what a money saver ! Everything included in package all way down to funnel and dosing cups . very good quality I trust my sps tank to this product ! The only thing i put 4 stars because this 1gallon set are not equal mix after you done with the Calcium you still had quarter of Alkalinity and quarter of Magnesium sulfate i wish they just give the same for 3 parts equally that way when you done all 3 parts are done at the same time hate to throw away other part or have to order other parts to finish it. I've been using this product In fact getting ready to do a re order. The kit as a whole is awesome. The dispensing nozzles could be improved. If they were 90 degrees it would keep the spills down. If you don't have the cup perfect, a good pump will shoot liquid over the cup and onto the floor. Also, liquid gets retained in the nozzle and drips out later. Its easier to just put the cap on the bottle and pour into the measuring cup. I don't know what is top of the list when it comes to qualities I appreciate most in the BRS 2 Part. Between the ease of use, easy to understand directions, very helpful videos, calculators that remove a lot of the guesswork, or the brilliant way my corals have responded to my delight since I started using it! I really wish when I originally ordered the 2 part, that I would have ordered the auto- doser at the same time because I wound up placing the order a week later. How to cutover to the BRS Pharma Calcium, Alkalinity, Magnesium from the Triton CORE7 BASE ELEMENTS - TRITON METHOD? I have a 180 Gallon tank setup that has only ever seen Triton Core7 additives. I dose these from four (4) DDR DOS reservoirs off of my Apex system. While I have crazy Coraline growth, I just don't see the growth I would expect from my Corals. Because of this I've been contemplating moving over to the BRS Pharma grade components, but I'm not really clear on the best way to go about doing this. Today I dose 42ml a day of the 4 parts of the Triton Core7 base, what would I need to do / think about to make the cutover?